A new politics building at Aberystwyth University will not be named after former Plaid Cymru leader Gwynfor Evans, it has been announced. After the politician died last year, students called on university chiefs to name the building after him. But the university says it is to be the International Politics Building. Student leader Menna Machreth said she was disappointed because their campaign had received backing from overseas students and politicians. 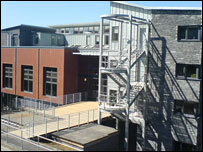 Ms Machreth, president of Aberystwyth Welsh Students' Union (Undeb Myfyrwyr Cymraeg Aberystwyth) (UMCA), said naming the building after Mr Evans would have been a "fitting tribute". But a university spokesman said it would be known as the International Politics Building. He added that the decision was made at a university council meeting on Monday following consultation with student leaders. The building will be opened by First Minister Rhodri Morgan on 25 July. The campaign to name the new headquarters of the Department of International Politics after Mr Evans became official student policy in October last year. Ms Machreth said: "Following Mr Evans' death last year, students thought it would be appropriate to name the building after him. It would have been a fitting tribute. "Although Mr Evans was a Plaid Cymru MP, he was also a respected internationalist and we thought naming the building after him would have inspired future students." Ms Machreth added that the students' campaign had not only received support from Plaid Cymru, but from Ceredigion's Liberal Democrat MP Mark Williams, as well as overseas students. Mr Evans - who became Plaid Cymru's first MP when he won a by-election in Carmarthen in 1966 - died in April last year, aged 92. The new building will be the new home of the department of international politics - the oldest one of its type in the world.